We invest in R&D to make you save time and money. A large part of PEL Pintossi's profit is invested in research & development, the aim being to design, test and industrialize technologies that optimise processes, increase efficiency and turn out perfect products, many of them highly innovative. The company's quality system, UNI EN ISO 9001, is implemented from the design stage. Rigorous testing and carefully-planned procedures have won the company numerous international approvals and product certifications. Some product lines comply with ISOTS 16949, adopted in the automotive industry. PEL Pintossi's decision to carry out the entire manufacturing process at the group's own production sites, where all critical stages - including laboratory testing - can be monitored at all times, is further proof of the company's commitment to a non-compromise strategy. 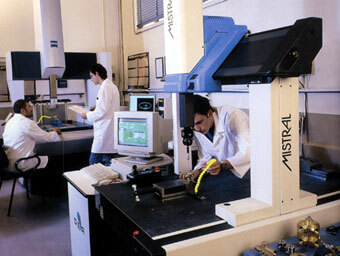 The laboratory equipment is interfaced with advanced computerised systems. This choice is part of a company policy to monitor the entire production process so that corrective actions can be implemented promptly in the constant quest for total quality. Each single item undergoes detailed inspections. Optimisation of the production process is backed up by a detailed inspection of each single item by specialised personnel using optical and digital equipment. This emphasis on product quality has enabled PEL Pintossi to establish sound relations with leading international groups based on continuous dialogue in the ongoing search for improvement and competitive quality.